AlphaNinja - Just released: Consumer credit down 7.4% in April, and March has been revised downward also. 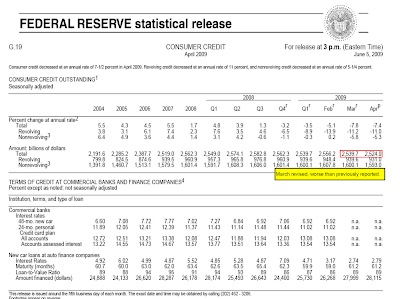 As bank balance sheets shrink, so must their ability to "rent out" that balance sheet to consumers, investors, etc. The great debt unwind continues. Bad bad news for our consumer-driven economy - what, about 70% of GDP?